MEXICO CITY A senior U.S. official says there is strong circumstantial evidence that Mexican federal police who fired on a U.S. Embassy vehicle, wounding two CIA officers, were working for organized crime in a targeted assassination attempt. Meanwhile, a Mexican official with knowledge of the case confirmed on Tuesday that prosecutors are investigating whether the Beltran Leyva Cartel was behind the Aug. 24 ambush. 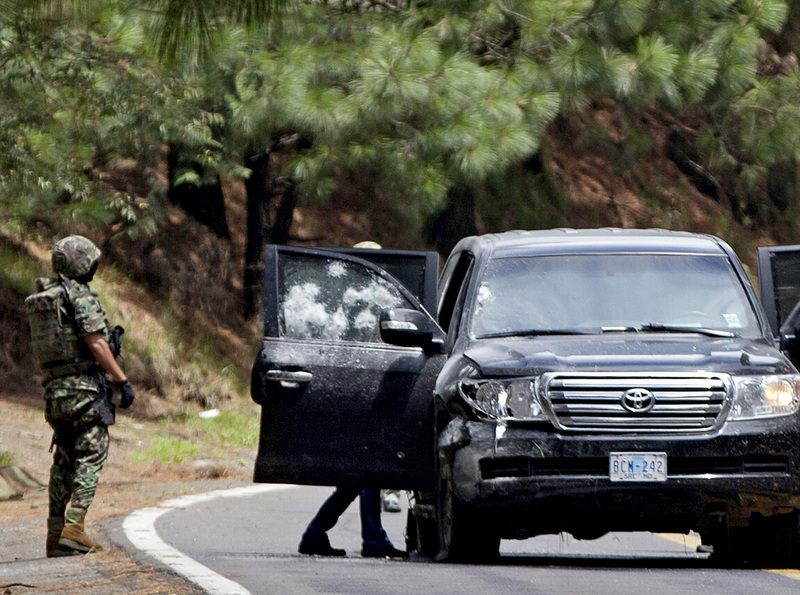 The Mexican official said that is among several lines of investigation into the shooting of an armored SUV that was clearly marked with diplomatic license plates on a rural road near Cuernavaca south of Mexico City. Federal police, at times battered by allegations of infiltration and corruption by drug cartels, have said the shooting was a case of mistaken identity as officers were looking into the kidnapping of a government employee in that area. "That's not a 'We're trying to shake down a couple people for a traffic violation sort of operation. That's a 'We are specifically trying to kill the people in this vehicle'," a U.S. official familiar with the investigation told The Associated Press. "This is not a 'Whoops, we got the wrong people.'" Border Patrol agent killed in Ariz. Photos of the gray Toyota SUV, a model known to be used by Drug Enforcement Administration agents and other U.S. Embassy employees working in Mexico, showed it riddled with heavy gunfire. The U.S. Embassy called the attack an "ambush." When asked by the AP if the Mexican federal police officers involved in the shooting were tied to organized crime, the U.S. official said, "The circumstantial evidence is pretty damn strong." Both the U.S. and Mexican officials spoke on condition of anonymity because of the sensitivity of the diplomatic issue. A federal police on Tuesday maintained the position that their agents fired on the vehicle by mistake, thinking it belonged to a band of kidnappers they were pursuing, according to a spokesman who was not authorized to speak on the record. The U.S. State Department declined to discuss details. "We will not comment on an ongoing investigation," said William Ostick, a spokesman. "This is a matter of great significance to both our countries and we will continue to cooperate with Mexican authorities in their investigation." The Mexican official said one line of investigation is that members of the Beltran Leyva Cartel were interested in attacking the people in the car because some of their lookouts had seen them passing through the area and presumed they were investigating the cartel. It's possible they didn't know they were Americans. The rural road near Cuernavaca where the attack took place is known territory of the remnants of the Beltran Leyvas, a once-powerful cartel now run by Hector Beltran Leyva since the Navy killed his brother, drug lord Arturo Beltran Leyva, in Cuernavaca in late 2009. Beltran Leyva was once aligned with Mexico's powerful cartel, Sinaloa, headed by fugitive drug lord Joaquin "El Chapo" Guzman. But the groups split in 2008 and continued government hits on Beltran Leyva leadership since then have splintered that cartel into small gangs warring for the area. The CIA officers were heading down a dirt road to the military installation with a Mexican navy captain in the vehicle when a carload of gunmen opened fire and gave chase. The embassy SUV tried to escape, but three other cars joined the original vehicle in pursuing it down the road, according to the original navy statement. Occupants of all four vehicles fired. "This is somebody with a powerful automatic weapon just unloading an entire clip, reloading, and continuing to fire at that same impact point, clearly with the intention of penetrating the armor and presumably killing those who are inside," the U.S. official told the AP. Surveillance cameras in the area recorded two civilian vehicles chasing the U.S. Embassy SUV, the Mexican official said. So far Mexican officials have said only federal police fired on the SUV. The two CIA officers received non-life-threatening wounds and have returned to the United States. The navy captain was uninjured and radioed the navy for help. Twelve officers have been detained in the case and are being held under a form of house arrest pending possible charges, and 51 officers have testified in the case. The FBI, which is leading the investigation for the U.S., has been in on interviews of the detainees. At FBI headquarters in Washington, spokesman Paul Bresson declined to comment. A Mexican federal police spokesman said last month that the officers may not have noticed the diplomatic plates. The official said police focused on the unusual sight of a bulletproof sport utility vehicle traveling at high speed on a rural road, not on the car's distinctive diplomatic plates. But Raul Benitez, a security expert at Mexico's National Autonomous University, said Mexican military sources have told him that "the attack was not an error," and "the objective was to annihilate the three passengers in the car." "The same car with the same people had been going up and back (to the marine training camp) for a week, so perhaps some lookout who worked for drug traffickers informed the police, or the Beltrans" about the vehicle, Benitez said. He said the federal police must have known that they were attacking a diplomatic vehicle. "I don't think we're yet in a position to say definitively who did it, who paid them and why they did it," the U.S. official said. "We have been assured repeatedly in private and in public that the government of Mexico will investigate this to the end and provide a final answer as to what occurred, and I think our posture at this stage is we take them at their word." Mexico's federal police agency, which President Felipe Calderon calls the most professional and highly trained of the country's law enforcement, has been hit with allegations of wrongdoing in recent months. In August, all 348 officers assigned to security details at the Mexico City International Airport were replaced in the wake of a June shooting of three federal policemen, who were killed by a fellow officer believed to be involved in trafficking drugs through the terminal. Ten federal police officers were arrested in the northern border city of Ciudad Juarez in 2011, accused of running an extortion ring. Attacks on diplomatic personnel in Mexico were once considered rare, but the CIA attack was the third shooting incident in two years. That could be the result of the break-up of larger cartels, said Andrew Selee of the Washington-based Mexico Institute, noting that historically drug traffickers didn't want the attention that a hit on U.S. personnel normally brings. "The lower level leaders in the cartels are making decisions the more seasoned leaders wouldn't," he said. "It's the lower level leaders who feel empowered to order hits."